Update Q3/2016: We published a new ranking, based on actual IoT projects which can be found HERE. Wearables have climbed to the top of the IoT applications ranking for Q2/2015, riding the wave of Apple’s introduction of the Apple Watch. Smart Home, that had previously occupied the #1 spot has fallen to the third position despite further product introductions by heavy-weights Google and Apple. Smart Cities have moved into second place, as Indian cities have started to embrace the concept. Smart Farming, a niche application of IoT, is picking up speed as TelCo operators make a move in this area. The IoT application ranking is published by IoT Analytics on a quarterly basis. The aim of the ranking is to quantify the popularity of the biggest IoT applications as the technology evolves. The ranking is an indication of overall segment activity and public popularity – it does not reflect the actual size of the IoT market segment. If you are interested in more charts and background on the ranking, click here: IoT application ranking. Q2 has seen a hype around wearable devices. 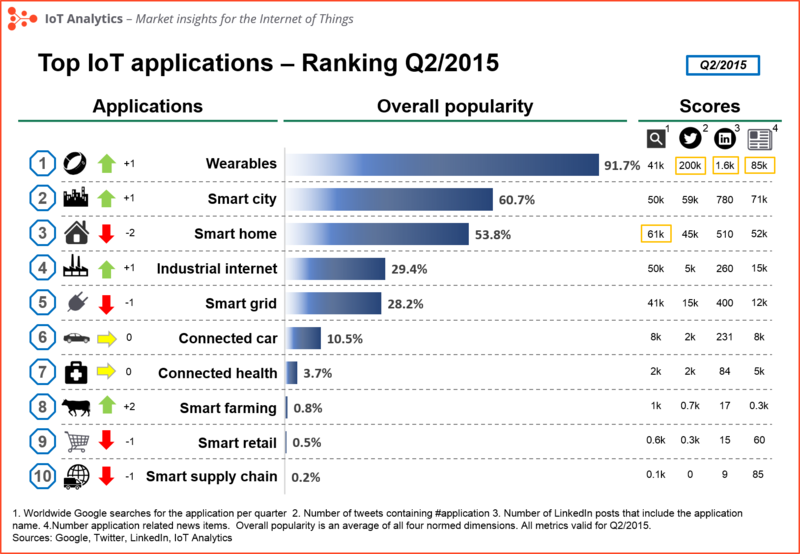 +33% Google searches and twice as many LinkedIn discussions have boosted the IoT application to first place in the ranking. Smart watches were the most important wearable application in Q2, led by Apple’s official release of the Apple watch on April 24. Further strengthening the position in the ranking was Fitbit’s successful IPO in June. It seems, however, that wearables have reached the top of the hype. Apple refused to release official sales figures for the Apple Watch as part of their quarterly earnings results (July 2015). While Apple claims that they haven’t done so for competitive reasons, many experts believe that the Apple Watch is not living up to its expectations. Feedback from users is also mixed. Many large cities have started initiatives related to “Smart Cities”. Boston, Barcelona, Copenhagen are making a strong push into that direction, to name a few. But the biggest push of all is currently coming from India. Last year, Indian PM Modi vowed to construct 100 so-called “smart cities” by 2022, an infrastructure project some estimate would cost $1 trillion. A year after the announcement, the plans are starting to be implemented and with it a lot of criticism and controversy. Many news articles in Q2/2015 shared a concern that this gigantic Smart City project would leave out the poor who have much greater needs than “smarter cities”, they need water and power. This controversy as well as the announcement of several US cities to start “Smart City”-initiatives (like Kansas City or Charlotte N.C.) increased the coverage for “Smart Cities. On top of that, Google launched Sidewalk Labs on June 11 with the aim to bring Smart Cities into the focus of other IT-companies. Smart home is still one of the most trending IoT applications, although it is losing two positions. Both Apple and Google continue to push the topic with new developments. The first HomeKit-certified products launched in June. Apple announced further HomeKit features for iOS 8 with the goal that every iPhone will soon be controlling a smart device by default. Google announced the first “Nest Security Cam”. Another prominent smart home company went public in June: Alarm.com. Somewhat surprising but quite logically, Smart farming is rising in the IoT applications ranking as well. Many companies are realizing that there are synergies between the IoT technology used in Smart Cities and for Smart Farming applications. Both areas have an outdoor-component that will require some kind of cellular (M2M) connectivity. Verizon’s IoT efforts, for example, include both new partnerships with Smart Cities Councils as well as Smart farming accelerators and farming conferences. Vodafone announced the expansion of its Farmers Club initiative to empower farmers through technology, especially in emerging markets. Subscribe to the IoT Analytics newsletter to stay on top of the latest IoT news and developments as well as future IoT application rankings. Jonas is a data analyst at IoT Analytics. With his backgound in physics, he specializes on IoT market models and popularity rankings. 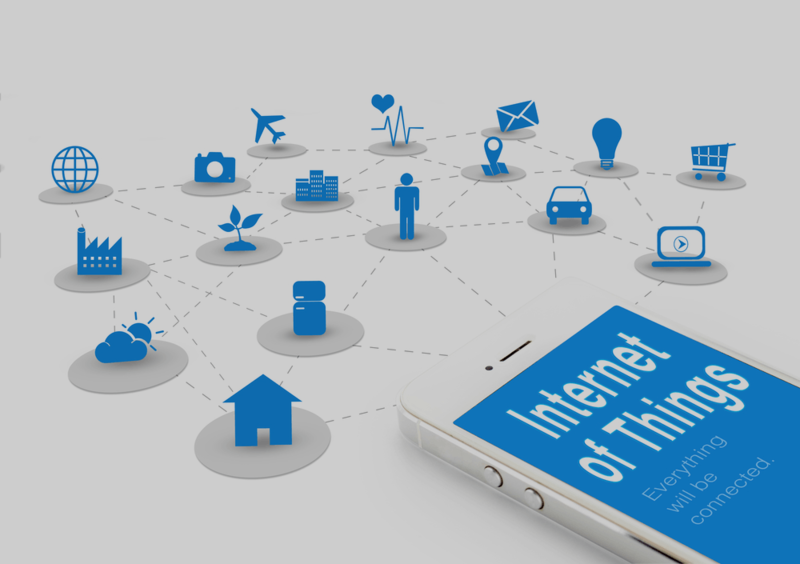 IoT Analytics provides market insights&competitive intelligence for the Internet of Things (IoT). It was obvious that wearables will make the Internet of Things even more viable than it was before. Thanks for the article, keep up the awesome blog! Wearables have nailed it. Been looking for a good resource on lot application ranking, and this one is best since it is simplified. Thanks for sharing. I wont forget to bookmark your page so I will be updated. I will make sure not to miss any updates of the ranking. Keep posting great blogs. Wearables made it again to the top. Thanks for giving such important info about new technology applications and updates. What those percentage mean? Do we have sample size? Who gave these rankings? Any info please. I was looking for information regarding Apple watch and I found your blog really helpful. Thanks for sharing it among us. I have already bookmarked your domain for further visit in future.